Gov. 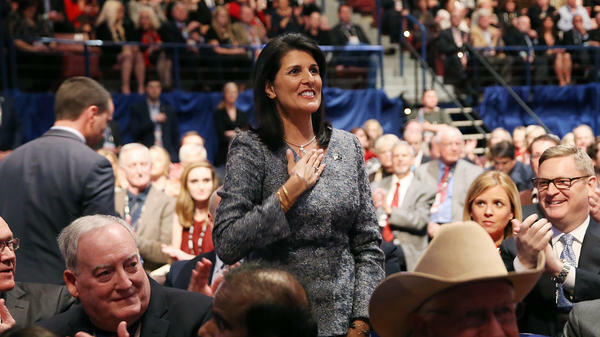 Nikki Haley, R-S.C. at Charleston, S.C., Republican presidential debate Thursday. Depending on whom you ask, South Carolina Gov. Nikki Haley's State of the Union response this week was either going to save the modern Republican Party or kill conservatism. This week, those differing responses evoked two different hashtags. Both, in some ways, were about Haley's heritage, and they bring to light the tricky way she'll have to navigate race should she take on a more prominent role in the 2016 election. After Haley gave the Republican response to President Obama's seventh and final State of the Union address this week, some conservatives were not impressed. Haley said in her speech that fixing immigration "means welcoming properly vetted legal immigrants, regardless of their race or religion. Just like we have for centuries." She offered a tacit rebuke of Donald Trump when she said, "During anxious times, it can be tempting to follow the siren call of the angriest voices. We must resist that temptation." The response to those lines, and other conciliatory notes in Haley's speech, was swift. And some of it was brutal. Conservative firebrand Ann Coulter probably went the farthest, writing, "Donald Trump should deport Nikki Haley." She was not alone. Conservative talk show host Laura Ingraham tweeted that Haley missed an opportunity to stand with "working ppl who want borders enforced," and "criticizing the GOP candidates dominating polls." "...it's almost absolute proof of what I have been saying for last couple years now, that the Republican Party's trying to drive conservatives out of the party. But I think it's more than that. It's certainly that, but her speech last night sort of expanded the theme of who is and who isn't qualified to be a Republican, and the Republican Party is still anti-conservative." But Coulter's statement was the one that became a hashtag: #DeportNikkiHaley. But it might be hard for Haley to become that standard-bearer if she can't shore up conservative Republican support. Some of the critique of Haley's response from conservatives online seemed to have a racial tint: Haley wasn't just wrong because of what she said; she was more wrong, for some on Twitter, because she is Indian-American. Soon after Haley's State of the Union response, writer Anand Giridharadas started the hashtag #IndianAmericanSouthernGovernorName. It was focusing on the fact that the name Haley uses now, Nikki, was not the one given to her at birth. (She was born Nimrata Randhawa) Anand tweeted, "Do figures like @nikkihaley & @BobbyJindal help to euthanize or medicate the dying idea of America-as-whiteness?" Of course, Twitter is not exactly or entirely representative of the real world, and even thousands of tweets for or against Nikki Haley might not accurately depict actual support or disapproval of her. Giridharadas in his New York Times article wasn't just critical of Haley; he said it was "thrilling" to see Haley attempt to "create a broader, two-party consensus on the simple, exceptional idea that an American is defined by shared hope, not shared blood." But wherever you stand on Haley, her story speaks to a certain truth in politics: race is tricky — and there's always going to be someone unhappy with how you talk about it. With Haley, we see a multi-dimensional (and, in fact, multicultural) tilt to America's ongoing struggle with race. A dichotomy of just black and white isn't big enough to comprehend or explain a Sikh Indian-American daughter of immigrants, who helped bring down what is, for many, a longstanding symbol of the enslavement of Africans and their descendants in America. Haley's story has layers. It is nuanced. It is not simple. And maybe that's how it should be.